What’s the reality of caring for loved ones in decline? We’re not likely to see the rawness, the intimacy, the messiness, the profundity of it in the movies or on TV – except for a few rare pathfinders. I first met David B. Oliver the way tens of thousands of people have met him—on YouTube. Not everyone would think, “This is a teachable moment” when they hear bad news, but David did and he saw an opportunity and we are better off for it. David and his wife, Debra Parker Oliver, possessed a deep knowledge gained over their professional lives researching and teaching about aging and end-of-life issues. That he responded to his own deadly illness in a meaningful way is tied both to his character and to his life’s work. David earned a doctorate in sociology and gerontology from the University of Missouri in 1972. He held several academic posts before joining the Heartland Health System where he met and married Debbie. As an administrator, Debbie had helped a small rural hospice acquire Medicare certification. During their life together, she too taught at the university and pursued her interest in applied research to benefit hospice patients. At Heartland, David was responsible for post-acute and chronic care services. He co-authored a book called The Human Factor in Nursing Home Care. David consistently focused on the importance of engaging in life and living rather than on death and dying. The Olivers produced their first short video shortly after David’s diagnosis in the fall of 2011. The diagnosis was Stage 4 nasopharyngeal cancer that begins behind the nose and spreads to lymph nodes and bones. Scheduled for chemotherapy treatments, David wanted to explain to his medical school colleagues why he would be absent from their upcoming meeting. His condition, he said matter- of-factly, was not curable but it was treatable. Depending on the effectiveness of the treatment, he might live for three to five years or he might live for six months. A robust man who had run three marathons in the early 1990s, David enjoyed a sprite’s sense of humor and a showman’s flair for the dramatic, especially as a fan of the football team at the University of Missouri. In the video announcing his illness, he broke out two “puke buckets”—one labeled for college football rivals Kansas Jayhawks and the other for the Oklahoma Sooners. He reassured his colleagues he was going to be all right. What followed was an outpouring of support and love from colleagues, family, and friends. The video found its way to social media, which widened their circles of support. In the ensuing months, the Olivers produced 28 short videos and an informative e-book called Exit Strategy: Depriving Death of its Strangeness. Videos typically range from three to five minutes each. 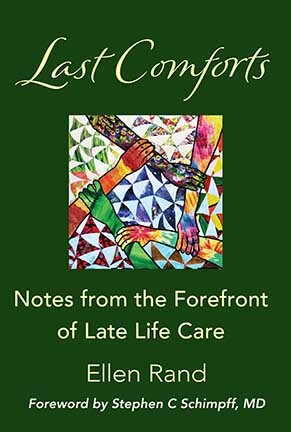 They offer a remarkable combination of practical advice for those undergoing cancer treatments and for those caring for those who are. They feature David’s upbeat, clear, and heartfelt philosophy of living life to its fullest. Most end with a hearty “Go Tigers!” for his beloved Mizzou team. Debbie has her own video, giving the caregiver’s perspective. Occasionally their dog Chewy makes an appearance (in one, he can be heard lapping up some water off-camera). The videos’ biggest achievement, David believed, was that it made people comfortable about this often-taboo subject. Debbie did the filming and editing, using a digital camera set on a tripod. They shot mostly in their home although one early video was shot in a salon to immortalize David’s hair being shorn prior to chemotherapy. Another was shot at his favorite vacation spot in Loch Vale Lake in Rocky Mountain National Park, Colorado. When it was time, that’s where he wanted his ashes scattered. The quintessential video is the fourth, “The 21 Days In Between,” in which David talks about how he feels between rounds of chemotherapy, which he found to have a predictable pattern. He uses a hand-drawn graph to show how days one to four are very good (a green bar); followed by the crash of days five through eight (a long red bar) and nine through 13 (a shorter red bar), followed by the green bar of days 14 to 21, after which there is another round of chemotherapy. Consistently ebullient, David is an eloquent spokesman for the joys of life. He is equally candid about the dark times: his difficult upbringing, his father’s alcoholism and suicide, his own struggle with alcohol, his failed first marriage. Nor does he mask his fears, his sometime denial about his condition, his frustrations with a health-care system that even he and Debbie—who are as knowledgeable and well-connected as any patients might hope to be—find too often to be brusque, uncoordinated, and insensitive to the ill and to their caregivers. It is the caregivers who suffer most, and who need more support, he emphasizes. Instead of what David felt would be wasting his time trying to battle the silent killer, he decided that if there ever was a time to teach, this was it. David went through five months of chemotherapy and unforeseen complications, such as clots in his lungs that caused paralyzing pain one day while he was working at the library. That landed him in the hospital. He retired from his position as a research and teaching professor at the School of Family and Community Medicine at the University of Missouri. David and Debbie spent the next 15 months traveling, and spending time with their five children and grandchildren. The visited with friends and they made videos. They made decisions about the time David had left. The cancer returned in June 2013. By the time I reached out to David and Debbie, I felt I already knew them, having watched their videos and read their book. In real life, they were the same wonderful people I had gotten to know in the digital realm. That January, David was considering not going for more treatment. He had developed a number of symptoms: fatigue, a deep vein thrombosis, dehydration, continued loss of hearing in one ear. So he thought, let’s get certified for hospice care now. But the palliative care team talked them out of it. Let’s do another PET scan, they reasoned, to see if the cancer was spreading and, if it was, to devise a palliation strategy, as opposed to “flying in the dark.” The Catch-22 of hospice, of course, is that you have to agree to give up any “curative” treatments; even palliative radiation could be interpreted as curative. “I’m a fairly smart guy, but emotionally it was difficult,” he told me. David was fearful of the results and didn’t want the results of the PET scan to change his focus on living. They talked about doing the next video. He returned to Alcoholics Anonymous to refocus on what is important. Their next video was devoted to how the 12 steps apply to death and dying. What if David becomes increasingly fatigued, or even bedridden, I asked. Did they plan to continue making videos to share his final decline? Debbie said yes, the plan was to continue although she understood that the burden would fall more on her and she admitted it was already becoming more difficult. Initially, Debbie had been reluctant to add “video star” to her life as a professional, a wife, mother, grandmother and now caregiver managing David’s care. “This is my passion and mission, but my natural inclination is to keep my personal life close,” she told me. What had swayed her was the realization that working on the videos, the book, and the blog would provide a wider stage and a larger audience than her research ever would. She chose to step up to this opportunity. A good sense of humor helps when caregiving and all it entails gets to be a bit much. She freely admits to sometimes feeling like, if the cancer doesn’t kill you, then, I will, she joked. Like David, she believes that caregivers get a lot less attention than they deserve. “We’ve got to change that,” she said. It’s key for the oncology team and the palliative team to coordinate so there’s one plan of care, he explained. But generally, “we’re not there by a long shot.” Continuously, they both stress that we all have to advocate for ourselves. It felt like a long time between our conversation and Video 25, which was posted in April 2014. It was all about palliative radiation. First we meet Ollie, the Olivers’ baby grandson (and half-way into the video, Chewy, the dog, made an appearance, settling on David’s lap). By this time, David had been suffering from headaches, vomiting, sore teeth, and extreme fatigue. The fatigue was reduced dramatically after David started using a C-PAP machine. The palliative care doctor believed that apnea had been a cause and that was confirmed in a sleep study. An MRI confirmed that the cancer was back and he chose 20 radiation treatments. “I see my body going,” he says, riffing on the idea of his mind and spirit separating from his symptomatic body, which he nicknames “Patch.” It’s freeing, he says. David is reassuring, as always. Ever the teacher, he explains why he has enrolled in hospice now rather than waiting for the very end stages of illness. He wants to get to know his team and vice versa. He sees his life as though he is in a canoe, paddling toward a cliff, and has assured his hospice team that when the canoe goes over that cliff, they can let him go. No! was my immediate reaction. In spite of what I know and what I do as a volunteer, I’m still capable of coping by denial. I know I wasn’t alone in mourning the eventual loss of a friend. I’m grateful for the lessons the Olivers imparted. What does dying look like? It looks like real life.